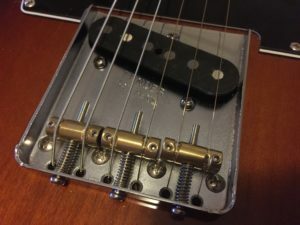 Tuning the guitar is of course easy, but if you encounter terribly flat or sharp notes around the 12th fret and above then you have a guitar that is not properly intonated. The problem arise when you have perfect intonation on one string and wrong intonation on another and they are both on the same saddle. Adjusting the saddle back or forth will improve the faulty string but the other will no longer be intonated. Replace the bridge with a newer 6-saddle bridge – will alter the looks, the feel, and probably the sound. Cost less than a new guitar, but more than new saddles. Replace the saddles with “compensated” saddles – might not give a perfect result, and might change sound. Cheap, quick, and you can do it yourself. I chose to replace the saddles, as it is the cheapest solution and less likely to change the sound and feel of the guitar. Please note that chosing a different material than the original ones will most likely change the sound. Replace brass with brass, steel with steel, and so on..
How does compensated saddles work? I´ve seen various designs, but mainly two variants: either the saddle is angled, or the saddle is designed so that it let´s the two strings meet the saddle at different positions. The whole idea is to acheive different string length even if two strings are on the same saddle. It´s a fixed difference, but calculated somehow.. Given that you are happy with your current string action, you probably want to have the same action with the new saddles. You can use a sliding caliper to measure the string height right at the saddle. This works if both the old and the new saddles have the string running on top of the saddle, otherwise youre just measuring the saddle and not the string. Write down the measurements before removing the old saddles. Change one saddle at a time. If you´re not planning on changing strings at the same time, just loosen the strings enough to let them easily slide on the bridge. It´s probably wise to save to old saddles, and you should properly mark them on the bottom side (low, mid, hi) or you wont have a clue if you decide to get them back on a later day. Even if your new saddles have the correct string spacing, they might not be as wide as the original ones. Take a look at the guitar neck how the strings line up. It´s easy if you are looking just from behind the bridge. When all saddles are replaced, tune the guitar. 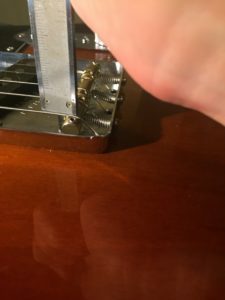 Check the intonation by properly fretting the string on the 12th fret. If it´s flat, shorten the string by moving the saddle forward. If it´s sharp, lengthen it by moving it back. Tune, play, check, repeat. In my case, I would say it defenitely was worth the money and effort. Intonation is no longer a problem. It was worst on the low E string and the G string. It´s still a bit off on the low E string above the 15th fret, but I rarely go there on the low E string anyway.. I would say that the sound is slightly changed, and it has a little less Telecaster “twang”. It could be that the Japanese made saddles are not made of top quality brass, but I would suspect that the groove design is enclosing the string more and has more surface in contact with the string. Using Thomastik-Infeld strings probably have more impact on the sound. Anyway, it suits my style of music. Another positive effect (unless it´s only imagination) is that the string feels more stable. 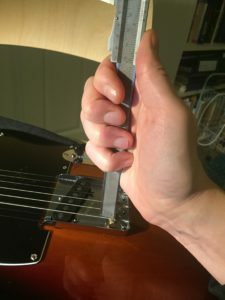 I´m not a heavy bender, but with the Gotoh saddles your not likely to bend the strings out of place. Cheap, easy, and fine results!